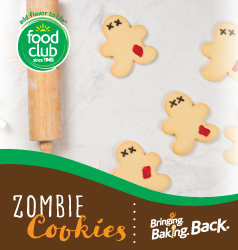 Eat these Food Club® zombie cookies before they eat your brains. Bring cookie dough to room temperature and sprinkle surface with flour. Roll the cookie dough to 1/4-inch thickness and cut using a gingerbread man shaped cookie cutter. Repeat the process until all of the dough has been used. Bake according to package instructions. While the cookies are baking, mix half of the frosting with red food coloring and the other half with black food coloring. Load frostings into piping bag with a detailing tip. Once the cookies have completely cooled, frost “x” shapes for eyes onto the head of the zombie cookie and a small red square wherever you would like. These cookies have risen from the dead and are ready to be served.